Renn Blackman is something of a rarity among local craft brewers in that he has rather a soft spot for lagers. In part, we assume it comes down to time spent at Camden Town in London, a trailblazing contemporary British micro that made its name with a German style lager when all others were focused on making ales. With Camden Town founder Jasper Cuppaidge heading to Torquay for a Good Beer Week collaboration feast, Renn had even more reason to add to his lager collection as the pair of them served up four different lagers for the event. 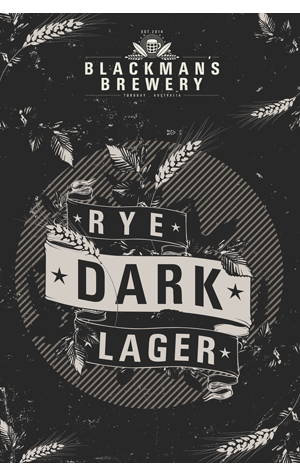 Among them was this Rye Dark Lager, designed as "a calculated mash up of three styles to show off what a lager can do". They are Schwarzbier (dark lager), rye ale and American pale ale; the resultant combo, says Renn is "dark in colour with ruby highlights", "citrus on the nose" with medium roast flavours and a "dry American hop bitterness. Rye adds a "caramel, spicy roundness" in what's intended as a warming winter lager.